Taking to the road and seeing Australia in a converted bus has been a great experience – one we intend to continue for some time. Lots of people ask us how this came about and what we did to prepare for life on the road. 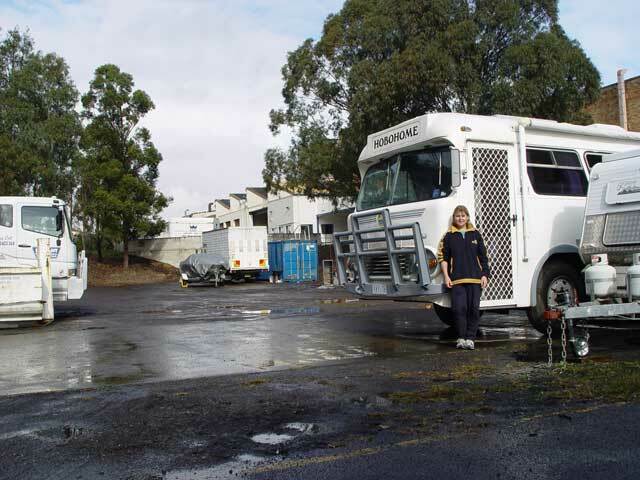 In this article we will look at what is involved in preparing for a life on wheels. I think for us, and I guess for most people, the hardest part is actually making the decision and putting a reasonable date on the departure. We originally plotted our escape as a three year plan. As we researched and read more, we became more excited and more committed to the idea and thus the three year plan became a six month plan. We were living in a rented apartment in Sydney, so did not have the burden of selling or renting out a house, so it was not a huge ask to get ready in six months. Of course the first task was to find the motorhome. In our case Hobohome was about the third vehicle that we looked at. For us, the Moke stored in the back was the big selling point. 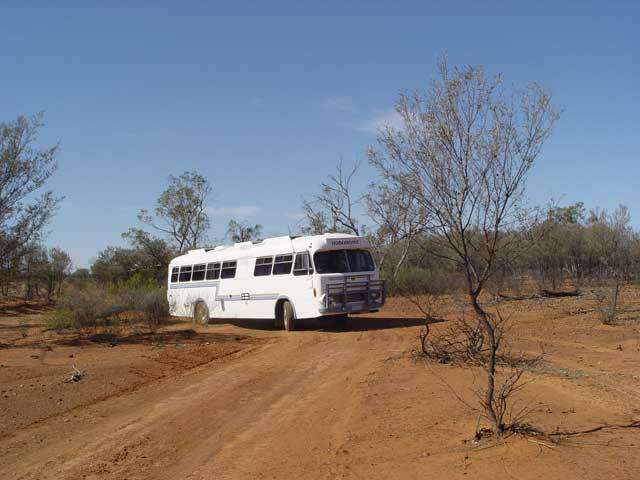 Wanting to explore the remote parts of the country meant that towing a second vehicle would not be practical and the bus had been very well setup for the type of living we intended (away from towns and services). Once the bus was purchased and a place to store it arranged, we spent almost every spare hour in it. Apart from a few small things, we did not change much at all until after we had the opportunity to spend a week living in it. From this time, we had a very good idea of what need to be changed to accommodate us full time. Mail – reduce your mail to a bare minimum. Stop all unnecessary bank statements, bills and get yourself taken off all mailing lists. It will end up being costly and inconvenient to have large quantities of mail forwarded to you. Bills – Almost all regular bills can be paid by auto-payment and those that can’t can be paid by bill pay. It is very difficult to receive and pay paper bills on time. Costs – Things that you do not worry too much about when you have a regular income (for example mobile phone bills) can get out of hand once you have no full time work. Look for the best deals and modify your habits to take advantage of these deals. Planning – Try to avoid planning too far ahead. We found that it was much better to remain flexible and not to promise to be somewhere at a particular time. Your greatest driver will be the weather – there are huge differences between summer/winter temperatures and you do not want to be in the wrong place at the wrong time of the year. Communications – The Internet is the best thing ever for travelers. I can’t imagine doing without it now. We use it for everything from banking to talking to friends and we even run our business via the Internet. If you are not comfortable using the net, I would recommend that you schedule a series of lessons before you take to the road. Also look at all the options for mobile Internet – cost is NOT the only factor. There is no point saving $20/mth by going with provider A when their coverage is so poor that you have to drive 50km just to get signal. We use Telstra NextG and for coverage, I don’t feel that they have any serious rivals. Maintenance – Try to do as much of your own maintenance as you can. Trades people are expensive and the quality of workmanship is extremely variable. I adopt the “give it a go” attitude and what I don’t know – I learn (sometimes the hard way). Learn everything you can about your motorhome or caravan before you take to the road. Make sure you have the necessary tools to fix things on the side of the road and take a reasonable inventory of spare parts. While it is great to be well prepared – there are things that will come up along the way. You will cope and other people will help. One of the best bits of advice was given to me by Mark the previous owner of Hobohome, when he said “When something goes wrong, don’t instantly reach for the tool kit. Grab a deck chair and a beer first. Give yourself time to think about the situation before you decide what to do”. I have followed this advice time after time and have always been surprised at how different things look after just half an hour of quiet thought. Are you about to hit the road and have question? Have you been living the lifestyle for years and have something to add to this list? If so, I’d love to hear from you. Why not use the “LEAVE A REPLY” box below or email us. This entry was posted on Sunday, August 8th, 2010 at 11:35 pm	and is filed under Caravan, Communication, Electrics, Internet, Motorhome, News. You can follow any responses to this entry through the RSS 2.0 feed. You can leave a response, or trackback from your own site. The only sticking point I have is the worry about how much money I will need to live o the road full time. In your opinion, what sort of average wage do you think people would need to make living on the road a possibility? I’m currently planning a 6 week “practice” trip up to Qld in November (Yup, picked the hot months to go.. eeek) to see how my daughter and I cope with that as well as to see how much living on average will cost us while we are on the road. Anyway, keep up the good work on your blog and I hope to meet you both on the road sometime after I’ve made the leap to full time motoring. This is a really tricky question. For the first year that we lived on the road we spent a total of $21,000 – that includes everything from storage to insurance. Now that was quite some time ago and things have changed. Off the top of my head, I would say that somewhere from $280 – $500 per week depending on how far you travel, how many things break and how much you eat and drink. BTW – sorry for the tardy reply – your message was flagged as spam for some reason! Thanks for your reply. Not sure why it went to spam, oh well. Wow, full time motoring is suprisingly affordable. I’ve started looking at my budget and I will be aiming for about $350 per week. Thanks for your help and safe travels. I’m an oldie and on my own and have been thinking this way of life for awhile now. Hoping to sell my house early next year, stop relief teaching, go to Oz(I’m a Kiwi) and follow the sun. However I am on my own and wondered how difficult maintaining the Motorhome would be. I am very good at maintining my house….carpentry and even plumbing (!) but never a vehicle. Also I think I saw Class C vehicles only require a car licence…is that right? It was a USA site. The cost of it all looks great! Delighted to have found your website…..but the waterblasting is still calling me!! You will absolutely love the lifestyle – there is nothing like it! Maintaining the vehicle is really not that difficult and what you need to be prepared for is largely dependent on where you plan to go. Most small towns have some mechanical service offerings and you are unlikely to ever be stuck. Aussies (like Kiwis) are generally very friendly, helpful people – I don’t really think it would be an issue (unless you are planing a lone Simpson Desert crossing :-). The motorhome club over here (the CMCA) has the very active group known as the “Singles Network” – these guys (and girls) are all single travelers who keep in touch and provide support for one another as and when required. We have run into lots of the members and they seem like a really great bunch. Any vehicle that weighs over 4.5 tonns requires a heavy vehicle license over here. Most small to medium motorhomes try to keep their weight below this to avoid this and other issues with regular inspections (WOF in NZ). I hope this helps and we hope to see you over here some time! How hard is it to have the dogs??? I had put a time of 3 years but it was already in my blood and I know Andy would love it. Maybe one day we will meet on the road. look forward to your reply, and enjoy, I know how great it is and that was before internet and mobile phones. Glad you like the site – loads of work goes into it. Yea, lots has changed – it is so much easier these days (we traveled Europe, the UK and NZ in a motorhome years ago). We have never had a dog, many people we meet do and they all seem to think it is not too difficult. National parks are of course a no no. We work from the bus – so do not often have to find external work. In my opinion – if you are multi-skilled and/or prepared to do most things, you will never be short of work. There is more work out there than you can imagine. 3 years is a long time to wait … good luck! Already updating my nephews bus who is now settling, and yes I am working on that 3 years, we both want this, and yes could not care what the work, both grew up on farms, so it is just to fill in the gaps and not use up ALL the kids Inheritance!!!!! well hopefully we will meet one day for a beer, and again thank you. just found this site and very impressed with it. I am considering getting a trakka 850. I want to start in my home state of WA. I have this idea of running a mobile law practice from it. Just will for country folk and those on the road. My wife is a teacher and bookkeeper. I drove trucks to pay my way through law school. That was back in ’68 so a bit of water under the bridge since then. The Trakka is 28 feet. I was wondering if there is ever any problem pulling up in suburban streets for the night if need be and there is room. I am thinking more of the east coast. Just had a look at the Trakka – it looks very nice – I would be a bit concerned about the lack of ground clearance – but I guess this is fine if you plan to stay on the bitumen . I personally think a mobile law service would be a great idea and with mobile connectivity as easy as it is now, it should no problem to service clients from anywhere. We often pull up on the street somewhere for the night. We are very careful about the locations we choose – never outside expensive houses on beach fronts etc. We actually fine that light industrial areas are very good (sounds awful, I know) – but we just seem to get ignored there. We try to be considerate by staying out of the way and not being in anyone’s face and our blackout curtains make sure that no light escapes from the vehicle at night to give us away. The work / lifestyle balance is just amazing … it is without a doubt the best thing we ever did. It would be very hard to go back to a normal life! We do not tend to go to caravan parks at all. They are expensive and provide us with almost nothing. Just as a brief response – I would suggest that if you intend to travel from caravan park to caravan park, a caravan would be a good option. If the intention is to setup for mainly freedom (free) camping, then a bus/motorhome is a better option. We have planning for the past six months to travel our beautiful country, we have the vehicle, caravan, power,communication- What I am stuck on is the Insurance for the caravan- can you recommend anyone, as we are using the caravan for work part of the time ie living in it during contract harvest and other jobs along the way and we will not have a permanent address (sold the house). Looking forwarding to your comments. Thank you for your web site very informative- I know more about solar power, batteries than my local 12 volt shop! Enjoy your new adventure on your block. Thanks for the comments about the site – positive feedback is always nice. Re insurance – we get our motorhome insurance via the CMCA motorhome club. This is supplied by Ken Tame and associates (a Google search will locate them) – they seem to be very good and may offer Caravan insurance as well. Hi, great site, just found it. Travelled ozz for 2 years in a 58 bedford bus for two years 31 years ago. Looking for bus to do it again but on permanent basis or untill im not upright and breathing anymore. I don’t see a problem with what you have planed. It will be heavy and will take some HP (and fuel) to tow, but should be ok. Our bus weighs about 11 tonn and develops 185hp – this also tows (a-frames) our vitara without any real issues (although mocks a half a liter per km from our fuel economy). 250 HP should be ok.
We’ve been thinking to travel about parts of Queensland for three months starting around end of August this year. We plan on finding work as we go, harvesting, general work etc. We’re a couple of novice Kiwis and had thought to have go this year (sorta do it and see) before committing to a more ambitious plan next year. For this first venture we had thought to hire a caravan from Brisbane, buy a suitable 4×4 towing vehicle and head off after ensuring through the various agencies that there would be some work in the areas we might like to go.What would you suggest would be the best option for hiring a self-sufficient caravan?We’d like to do this to see if its for us or not before buying. Do you know where we could store our vehicle for the best price when we come back to NZ for Christmas? Much appreciate your website. Cheers, Dave. Very wise. I advise many people to try (by renting) before you buy. The big problem you will face is that most (all?) rented caravans/motor homes are setup for caravan park stays punctuated by the odd day of free camping. If you are happy to work you will have no problem finding it. Highly recommend the west coast for free camping and well paid work. 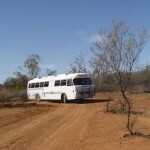 Hello, I recently purchased a Mazda 88 t3500 converted bus, I plan to travel and live full time, he is a he, Sydney. Pump. I was happy to have a fitted shower, I didn’t want to go out side, as I am only traveling with my 2 ill dogs. time but he has been gone since 2004. I picked the bus up from ACT and drove it home to the Sunshine Coast QLD. There amongst all the papers was my dads invoice. A bit special. I will defiantly get the wiring for the power to be that of the bus, however can you please recommend a generator, I ideally want to live off the grid. Quiet and approx a 2000. Thank you, I hope to be on the road this Nov. Michelle. Love the story of the inverter – it is a very small world! It is very hard to recommend any generator other than a Honda. For economy and reliability they are just unbeatable. Unfortunately they are also the most expensive (2kva is about $1600). You could try one of the Honda copies currently selling on eBay for around the $300 mark – but if you want something that will still be working in 10 years, I’d bite the bullet and buy a Honda. Ours is almost 10 years old and still working perfectly. My partner and i have been together almost 9 years and have maily worked in resorts like Fraser Island, Hayman Island and Ayers Rock – Uluru. 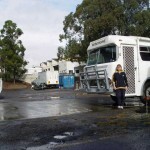 We have wanted to just do the caravan thing since we got together and after living on the mainland for a few years trying to do the stable job and house thing we just cant, we work and live somewhere for about a year and then go, itchy feet! We have now made the decision to do it and we have about a 6 month plan, i was made redundant just before christmas and have a few interviews next week but ive never really been out of work so thats okay. What i would like some help with is i dont really know much about caravans other than all the camping trips that we have done, even with flash camping gear and a great tent, is that everytime someone pulls up in a camper and only takes 3 minutes to set up and have a cold one i think “lucky bastards”. Now that we plan to just go and do this im so excited but as i said dont know much about them. We know from travelling around the country and living in different states and having lots of different jobs that things are different depending on where you go but i would like any other helpful hints on what its like living in a caravan, for example washing, i have seen caravans with washing machines but they are small, i have a bit of a beef with the coinage required when you go to a park but you get a full size machine and plenty of drying room or dryers if the weather is no good. i figure if i am still going to take a short term retail job or bar fruit picking whatever i will need uniforms etc, my partner is in earthworks and i cant imaging that for the storage space we could have should we have a washing maching? Also just any other tips for starting out looking at vans, gotta say i dont like all the wood grain stuff but seems that if you look there are others, we are fairly simple people and dont need a big flash van, but we do have to live in it. Any ideas or notes would be greatly appreciated. Work is always on peoples minds … how can I be sure to earn enough to eat. Well I can tell you that in my experience it is just not an issue. If you are willing to work and prepared to give anything a go, you will not be short of work. The huge advantage you have a a traveller is the ability to move to where you are needed and be self accommodating. Well this is tricky – I suggest talking to lots of people, looking at lots of options and making a list of what you think is important. Think carefully about where you will travel, how quickly and how often you will move on and whether you will stay in campgrounds or free camp. All of these things will determine what type of vehicle is best for you. My most important suggestion would be “don’t even consider doing your own motorhome conversion” – you have no idea how many of these never get completed … even after years of work. Well I hope this helps – feel free to email or message if you have any questions. Cheers – and good luck – a whole new would awaits you both! Was wondering if you had a list of small flat towable vehicles. Currently the Vitara seems to be it. Does not necessarily need to be 4wd but would prefer it. Can’t wait to get out there as we have just sold our yacht in Malaysia and haved moved back into our house (vrey temporarily) while we get set up with the motorhome and tow vehicle. Thanks for your very informative site, love it. There is a good list at http://hitchngo.com.au/aframe_vehicles.html – I think most 2WD vehicles are ok. BTW – I DON’T recommend the manufacturers Hitch-n-go – they are over prices and their customer service is shocking. We are currently trying to decide between a campervan and a motorhome to travel around Australia. Could you please let us know the pros and cons of each, particularly when it comes to dirt road driving across the top end? There are only the two of us but my wife likes the space and creature comforts of a motorhome. Also what engines would you recommend and are there any makes we should avoid? Your feedback on these issues would be greatly appreciated. As far as engines are concerned – it depends on budget and the age of the vehicle you are looking at – I *hate* the two stroke GM engines (that you can hear coming from the next state).